ST. PETERSBURG—Today, renowned environmental journalist and whistleblower Grigory Pasko plans to submit a formal complaint to the Moscow City Court against Russias Ministry of Defence, insisting that the ministry declassify information about radiological accidents and technical failures aboard Soviet submarines that took place between 1961 and 1985. According to information obtained from open sources by the Environmental Rights Centre Bellona, or ERC Bellona, the St. Petersburg representative office of the Bellona Foundation, at least 15 then-Soviet submarines suffered nuclear reactor accidents at an average of more than one accident every two years. 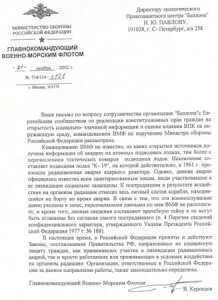 The history of Bellonas inquiry to the Defence Ministry to declassify this information began last year on July 18th, when ERC Bellona sent a written appeal to Russias defence minister, Sergei Ivanov, requesting he make public information about accidents that occurred aboard Soviet nuclear submarines. These subs, which are laid up at the bases of the Russian Northern Fleet, have been retired and await full dismantlementsome with their spent nuclear fuel still on board. Others, like the infamous K-19, have been defuelled and are slated for destruction. Still others have been fully destroyed, mostly with US threat reduction funding, and their spent nuclear fuel sent to the Mayak Chemical Combine for reprocessing. Nikitin himself is no stranger to Russias cult of secrecy: In 1995, he was accused of treason through disclosing state secrets while writing Bellonas well-known report entitled The Northern Fleet: Potential Sources of Radioactive Contamination of the Region. After his arrest, 11 months in custody of the secret police, and a 5-year legal struggleduring which it was proven in court that all information Nikitin had compiled for the report came from open sourceshe was fully acquitted of the charges by Russias Supreme Court in January 2000. In November 2002, ERC Bellona received an official response to its inquiry on declassifying the submarine accidentsbut it did not come from Defence Minister Ivanov, to whom it was addressed. Instead, it came from none other than the Russian Navys commander-in-chief Vladimir Kuroyedov. The Navy is unaware of any open sources from which the information about accidents aboard nuclear submarines has been obtained, especially information enumerating the tactical numbers of the submarines, Kuroyevov wrote. Pasko, like Nikitin, was arrested on treason charges in Vladivostok on November 20th 1997. The FSB accused Pasko of espionage based on his collaborative work with Japanese journalists, which included giving Japanese television a videotape made in 1993 that showed the Russian Pacific Fleet ships illegally dumping nuclear waste in the Sea of Japan. In 1999, the court acquitted Pasko of treason, but convicted him of abuse of his official authority for his supposedly negligent contacts with the Japanese media. Pasko was immediately amnestied, but he appealed the amnestyand, by default, the convictionto the Supreme Court on the foundation that an innocent man cannot be amnestied. The unexpected result of that appeal was new trial and a conviction in December 2001 on the same charges of treason that Pasko had earlier been acquitted for. The foundation of that conviction was a set of notes he made while attending a meeting of naval brass while working as a reporter for the Pacific Fleet newspaper, Boyevaya Vakhta. In December 2001, the Pacific Fleet Court in Vladivostok acquitted Pasko of charges that he had passed the noteswhich allegedly concerned "secret naval manoeuvres"to the Japanese media, but convicted him for allegedly intending to pass the notes on. His attorneys, Bellona and rights groups throughout the world maintained that these charges were fabricated by the FSB and relied heavily on two now-defunct secret Defence Ministry decreesNos. 010 and 055. Pasko was sentenced to four years hard labour in a prison colony near the Russian Far East town of Ussuriysk. He was, however, paroled for good behaviour on January 23rd 2003 by the Ussuriysk City Court after serving two-thirds of his sentence. Pasko has never accepted any blame for the charges that sent him to prison. He is working with his lawyer, ERC Bellona Director Ivan Pavlov, to clear his name of the unlawful conviction. But it will be a long road. Having exhausted all his means of reversing the 2001 conviction in Russia, Pasko and his legal team have sent his case to the Strasbourg Human Rights Court. 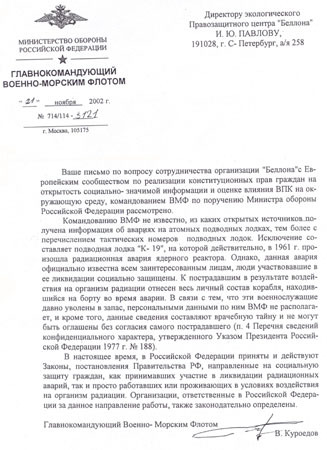 Kuroyedov, in his terse reply to ERC Bellona, admitted to only one accident: the one that took place in 1961 aboard the Northern Fleets K-19, whichas the subject of a recently released, star-studded, and highly fictionalised Hollywood film K-19: The Widowmakeris hard to keep under wraps. The ballistic missile Hotel class K-19s near-catastrophe was the first nuclear accident to occur aboard a Soviet nuclear submarine. On July 4th 1961, during exercises in the North Atlantic, close to NATO facilities, a leak developed in the K-19s reactor cooling system. The leak caused a sudden drop in pressure, setting off the reactor emergency systems. Left unchecked, the leak could have led to a core meltdown of the reactor. To prevent the overheating of a reactor, superfluous heat has to be removed, and this is done by continually circulating coolant through the reactor. There was no built-in emergency system for supplying coolant to the K-19s primary reactor circuit, and it was feared that an uncontrolled chain reactionleading to a nuclear explosion several times more powerful than Hiroshimamight start. In the tension of the Cold War, the K-19s crewclose as it was to NATO installationscould neither call for nor accept American help. Likewise, a reactor explosion, had it occurred here, in the proximity of the NATO facilities, might have been construed by the United States as a nuclear first strike by the Russians. Aboard the K-19, an improvised system to supply coolant to the reactor was devised. This required officers and midshipmen to work under conditions of extreme radioactivity in the more remote areas of the reactor compartment as they tried to repair the leak in the primary circuit. Radiation exposure on the K-19 came primarily from contaminated gases and steam. All of the crew was exposed to substantial doses of radiation, and eight men died of acute radiation sickness after having undergone doses of 50 to 60 sieverts. The crew was evacuated to a Soviet diesel submarine, and the K-19 was towed home to the Kola Peninsula, repaired, and continued to serve for several more years. The film version of the incident aboard the K-19starring Harrison Ford and Liam Neesonwas produced by Katherine Bigelow, who called the film a fascinating tale of ordinary people who became heroes when faced with a tragic situation. According to survivors of the K-19 incidentmany of whom are members of St. Petersburgs Submariners Club and were presented with the movies original scriptthe films accuracy stops with its treatment of the reactor failure. Otherwise, the script generated anger and many among ex-K-19 sailors threatened lawsuits against Bigelows studio for the films portrayals of drunken and incompetent crew members, according to Moscows English-language daily, The Moscow Times. Other detailed, but unofficial information about the accident can be found in Bellonas 1996 report The Northern Fleet at www.bellona.org. Kuroyedov neglected to mention the K-19s death toll: lieutenant commander Povstyev, lieutenant Korchilov, sergeants Ryzhikov, Ordochkin and Kashenkov, seamen Penkov, Savkin and Kharitonov. The information on their deaths was finally published by retired rear admiral Nikolai Mormul, a harsh critic of Soviet secrecy and official fabrications about Russias nuclear industry. In the early 1990s, Mormul was among the first to draw attention to the necessity of dismantling laid-up submarines and handling their nuclear waste. Mormul, with Nikitin, was one of the authors of Bellonas controversy-inspiring North Fleet report. Organisations responsible for this kind of work have been appointed and legislatively codified," concluded Kuroyedov. Pasko, who has interviewed several survivors of various radiation accidents on Soviet and Russian submarines, did not buy the naval commanders response. Even the social security for the K-19 victims alluded to by Kuroyedov, Pasko said, was grossly inadequate. ERC Bellonas Pavlovwho is responsible for writing the legal complaints in these proceedingsclaimed that the case cannot be related to the state secrecy law until the defendant, in this case the Defence Ministry, can prove that it is. The Moscow City Court, during of one its sessions on August 12th 2003which coincided with the third anniversary of the Kursk submarine disasteragreed that the case fell outside the jurisdiction of the Presnya District Court. The city court will be considering the case this autumn. Defence Ministry representatives were not available for comment on the case. It is ERC Bellonas assertion that, because the Defence Ministry is concealing significant information and disregarding official inquiriesthe inquiry about the submarine accidents being a case in pointit will have a difficult time constructing its defence. Information about emergency situations, ecological information and other information pertaining to the safety of populated areas, industrial infrastructure, and civil population cannot be ascribed to the category of restricted access. Also available to the public and forbidden from classificationaccording to Clause 7 of the law On State Secretsis any information pertaining to civil emergencies and catastrophes that threaten the safety and health of the population; to natural disasters and official forecasts about disasters and their prospective consequences, as well as information about ecological conditions. On the basis of this, and Article 15 of the law On State Secrets, ERC Bellona asserts that information about accidents and incidents on the nuclear submarines cannot be classified or restricted in any way, as reactor and other radiological accidents aboard submarines have a direct impact on the environment. The Chazhma Bay accident occurred on August 10th 1985 when the two-reactor Echo class submarine K-431, project 675, was being refuelled near Vladivostok. During the refuelling, a thermal explosion ruptured both the aft bulkhead of the submarine and its pressure hull, hurling the freshly fuelled nuclear reactor core, as well as the roof of the refuelling hut, some 80 metres around the refuelling site. A resulting fire in the reactor compartment was localised after four hours. The radioactivity released during the explosion was around one seventh of the total released in the Chernobyl disasteror seven times that which was released during the Hiroshima bombing. According to the official casualty figures, 10 were killed instantly, 10 suffered acute radiation sickness and 39 were irradiated at sub-acute levels. The ship itself has not been decommissioned yet and still poses a danger, floating near its berth, its bow beached on the shore. The spy scandal surrounding Pasko temporarily postponed last spring Japanese financial aid for decommissioning a number of the Pacific Fleets ailing submarines, including the K-431. As of last fall, the Japanese aid project has been renewed. The nuclear submarine Kursk of the Oscar-II classthe largest attack submarine ever builtsank on August 12th 2000 in the Barents Sea during a Northern Fleet military exercise. The Kursk, which went down when torpedo fuel exploded in its torpedo bay, became the fourth nuclear-powered submarine from the Northern Fleet to sink. All 118 people onboard died after international offers of help, which may have saved at least some of the crew, had been rejected by the Kremlin. After a week of Russian efforts, a Norwegian diving crew was finally permitted to open an escape hatch on the submarine, which it did in less than an hourbut by then the Kursks crew had been long dead, some from the initial blast, others from resulting fires, and the last survivors from oxygen deprivation. The Kursk was partially lifted from the floor of the Barents Sea. But according to Bellonas data, the other nuclear submarines that the Russian navy has lost over the years are lying at the bottom of the ocean. The K-8, a November class submarine, sank in the Bay of Biscay on April 8th 1970. The two-reactor submarine sank with 52 crew members onboard after a fire started in its central and rear compartments. Another submarine, a Yankee class vessel with the tactical designation K-219, is lying at the bottom of the Atlantic Ocean north of Bermuda. It sank on October 6th 1986 after an explosion in one of its missile tubes. At the time of the explosion, only one of the submarines two reactors was running. One sailor died while trying to lower control rods into one of the reactors. Three others died in the smoke and fire that resulted from the explosion. The entire submarine sank, bringing with it its two reactors and 16 missiles with nuclear warheads. A fire was also the cause of the Komsomolets disaster on April 7th 1989. The K-278, as the Komsomolets was designated, is lying in the Norwegian Sea at a depth of 1,685 metres with its reactor and two nuclear plutonium-based warheads on torpedoes. The fire, which occurred in the seventh compartments electrical system, caused short circuits throughout the K-278s electrical infrastructure that set off the single reactors emergency system. The disaster killed 41 sailors in icy arctic waters as the Komsomolets sank. Currently, there are fears that both the Komsomolets reactor and warheads are leaking presenting a potential ecological danger to the Norwegian coast. In addition to Russian submarines, two American submarines are lying on the sea bottom. One is USS Thresherdesignated in US military terminology as the SSN-593which sank some 350 kilometres east of Cape Cod, Massachusetts, on April 10th 1963 during deep-diving tests. It took the lives of 129 officers, crewmen and civilian technicians. The ships remains were located on the sea floor some 2800 metres below the surface. Another US submarine, the USS Scorpion, or SSN-589, was lost with its entire crew some 640 kilometres southwest of the Azores in May 1968. In late October 1968, the Scorpions remains were found on the sea floor over 3,300 metres below the surface. Its hull had suffered fatal damage, the cause of which is still unknown. Information about both US submarine disasters, as well as information about other incidents within the US nuclear fleet during the Cold War, can be found at the official website of the US Department of Defence at www.defenselink.mil. Defuelled at Polyarny shipyard. The submarine is currently in a dry dock at Nerpa shipyard waiting for dismantlement. Discussions are underway on whether to convert K-19 into a museum. 1986/87 Cleaning unit leakage The submarine has been under upgrade and repairs at Sevmash shipyard since 1990, was to enter active service in 2003. Dismantled at Zvezdochka shipyard in Severodvinsk in 1998. Reactor section towed to Sayda Bay. 1985: Leaky steam generator The submarine was in service in 1997. Discussions are being held with CTR to fund dismantlement. 1984: Leaky steam generator Dismantled at Zvezdochka shipyard in Severodnisk. Reactor section towed to Sayda Bay in 1995-96. 1984: Leaky steam generator Dismantled at Zvezdochka shipyard in Severodnisk. Reactor section (8-compartment block) towed to Sayda Bay in 1994. Reactor section towed to Sayda Bay for storage. Main ballast tanks no. 1, 5, 6, 9, 11, 12, 13 are leaky. 1986: Critical underspace leakage of primary circuit Reactors defuelled by Imandra service ship in autumn 2000. Submarine laid up at Shkval shipyard in Polyarny. What is the Committee for Veterans at Special Risk hiding?